Oh, Louisville Kentucky I just love you! This was our 3rd time for a Gramercy Wedding this season, and every time we are there we LOVE this venue even more. When I met Megan and Omel for the first time last year, I knew this event was going to be one of my favorites of the season! Their coffee shop engagement session was perfect, they are tons of fun but still so sweet. Megan planned and thought through every wedding detail and to see her love on her friends and family so well, on her own special day, was a beautiful thing. We started this rainy wedding day at the Embassy Suites in downtown Louisville. The hospitality suites are so clean and fresh with lots of bright accents and natural light. My absolutely favorite scenario for details and getting ready images! The girls all stayed Friday night, getting lots of time to hang together. Although the forecast wasn’t what we would have chosen, we made the most of the chilly first day of fall air and the ton of fun everyone brought to the day. After a gorgeous morning of getting ready, we hopped on the Louisville Trolly and headed out to Cherokee Park to capture some portraits. The rain set in right after the guys finished but the girls were still all smiles. Saint James Catholic Church waited for us where Omel and Megan got to walk down the aisle see each other for the first time! What a perfect moment it was after the usual hustle and bustle of the morning. Ending at the Gramercy with the Kudmani Band was the perfect end to such a gorgeous and heartfelt day. While I usually reserve vendor shout outs for the end of the posts, I have to pause and say to anyone currently planning a wedding, go book these guys immediately!!! KUDMANI had the entire reception on the dance floor all evening. All generations, all level of dance enthusiasts, it was so much fun to be apart of! Their talent and passion for what they do is evident! Now back to our gorgeous morning. 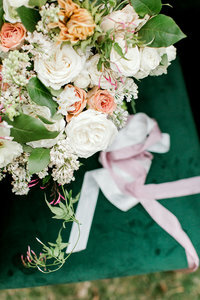 Enjoy a few of our favorite images from this rainy, Gramercy wedding day! We love you Omel and Megan. Thank you for having us and letting us celebrate alongside you! I would be remiss without mentioning Megan’s STUNNING gown and bridal veil. I’m actually really excited because after the day ended up being so rainy, we decided to schedule another mini shoot JUST for more bridal and couple’s portraits. This show stopper was hand made by a local Louisville vendor (her contact info is at the bottom of the page) and is truly a work of art. We just couldn’t risk bringing it through the mud, but we know this one is going to prove gorgeous flying in the wind!! I’m so excited to be able to shoot with it again soon! I’m always thankful when couples decide to embrace the rain! It really was pouring all day, but for me, it’s about capturing what really happened. We still got some stunning portraits umbrellas and all, and there’s nothing like this Newley wed glow right after you’re married! Cheers to you both, Megan and Omel, for wearing smiles all day long no matter the circumstances!! Tyler Park proved to be a little refuge with some pretty outdoor options. The perfect spot in Louisville to finish with portraits before heading to the Gramercy. Like I mentioned, the Gramercy Wedding venue is one of our favorites! The staircases, the beautiful chandeliers and archways. It’s truly stunning! To the vendor team that made this day absolutely incredible, thank you! It’s a blessing to work alongside true professionals. Wow. What a beautiful gramercy wedding. I love how you captured their special day. I’m sure they will love these for years to come. love how classy this Gramercy Wedding is! The gifts the bride and groom got were lovely as well and the picture of her tearing up is so sweet! Woah! What a beautiful and extremely well decorated wedding. I love your attention to detail. I loved looking through these. Truly beautiful. Lovely Gramercy wedding! Such a gorgeous venue. This couple is so beautiful and in love. Awesome images!! What a charming, yet fabulously fun Gramercy wedding! Excellent job on documenting the moments as well as the details! What a gorgeous couple! I absolutely love her veil. Catholic weddings can be really challenging to photograph and you did such a great job. You did a great job styling those details! Kudos to the couple for going with the flow & not being scared to get a little wet for killer portraits! Beautiful job on this Gramercy wedding!